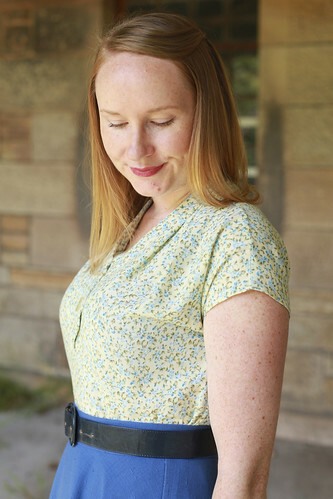 Thanks so much for all of your comments on my plaid dress – it’s quite reassuring to know that we all seem to be in the same boat when it comes to sewing with plaid. We love the outcome, but it’s a long hard slog to get there! Let’s talk about this blouse that I’ve named ‘The Afternoon Blouse’. I have to honest, I’ve always been a bit envious of those that seem to be able to whip up garments in a day (or a matter of hours!). I’ve never been able to do that. 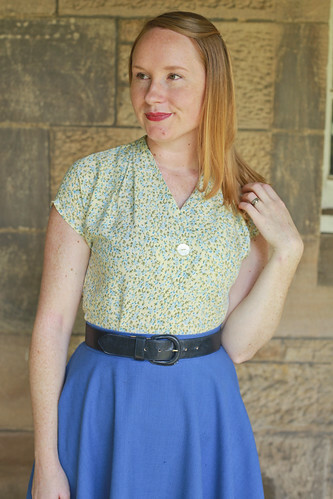 I could probably whip up a circle skirt relatively quickly in a day if I wanted to (or desperately needed to), but because I like to take regular breaks and my time is limited, my garments are usually made up over a few sewing sessions. Having said that, I was really quite proud of myself when I made this blouse from start to finish on Boxing day afternoon last year. This is number 2 on my sewing list now complete. The blouse was really very simple and quick to make up. I made one change in the pattern which involved pinching out quite a lot of fullness from the bust area (about 2 inches) before tracing my pattern ready to use. You can’t really tell because of the fabric, but the little front button detail is very sweet and makes the blouse look a tad more difficult that it actually is. In fact, my button isn’t actually even a working button. The small v-neck is just big enough to make this a ‘pull over’ blouse with no zips or closures. I plan to make a few more of these in plain fabrics so that the front button detailing is more of a feature. 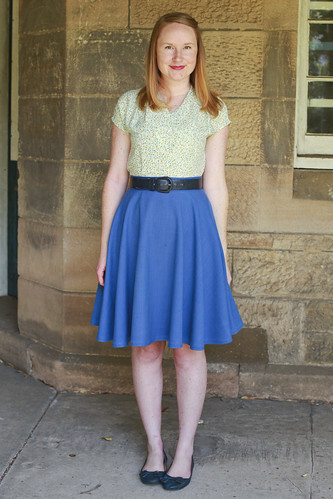 The circle skirt is one I made last year. I’m really interested to know how all of you like to sew – is it short sharp bursts like myself or do you prefer to complete your projects in one go? Unfortunately, I am more of the cut everything out, start sewing it and then lose focus for months or years before either picking it back up or no longer liking it. Sewing takes quite a while for me- things never seem to go right or by the pattern! I tend to lose focus aswell, especially if things go wrong! Your blouse looks absolutely divine! Good on you for working so hard and fast at it! So pretty and so timeless. What a great pattern. 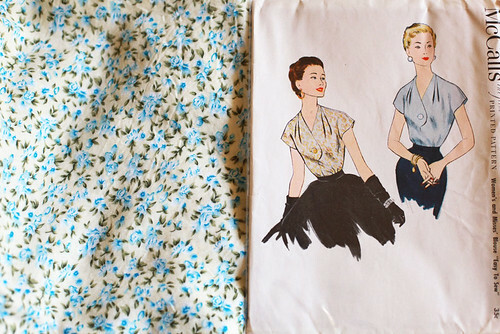 Lovely blouse, I want to make one now. Could you please tell me the pattern number? Thanks. Hi Ronnie – it’s McCall’s 3030, and I believe it’s from the 1950’s 🙂 Hope that helps!! I love this blouse. I am not one that can sew an item in one sitting either. Even easy patterns. Nice work. It is lovely. Gorgeous and timeless. Perfect match. I’m planning on a couple of blouses this year, so this is very inspiring! I tend to sew madly, though I realise in a very organised fashion! And am always working on several projects at a time. I have two children under 5, and fit sewing in mostly when they sleep and at night or when I get a morning to myself, usually less than one hour… when I have the chance I binge cut, a number of projects/dresses, mark, pin darts etc, wrap them up with their notions, and they await those free moments, then I carefully zig zag edges, sounds pretty nerdy, I suppose, but then I keep one colour thread on my machine, and say finish all edges for a number of garments. At the moment it’s two dark dresses. I have never completed an entire dress in on sitting, but as my projects progress, I can complete a couple per week, which is exciting. I find it really interesting reading how other sewers work – thanks for sharing and asking. What a terrific blouse pattern, you could make it in prints and plains and wear it everywhere. And even, a matching skirt so you have a 2-piece dress! Love it. I love the blouse. Sounds like a great pattern. I tend to spend a weekend cutting everything out for a few projects. Then they go in thier project bag till they are ready to start. when I start a project I’ll usualy spread it out and do a few hours each day as as a hand sewer there’s only so much sewing you can do before your fingers are red raw. Beautiful. I love this very much. It’s always nice to see a finished product on a real model instead of the unrealistic drawings on the old patterns. Thanks! Going to look for this one on my next hunt!